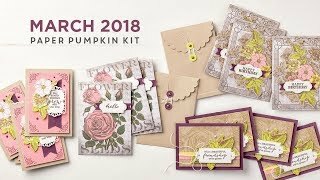 Thank you so much for taking part in the fabulous World Cardmaking Day Blog Hop hosted by my favorite organization - Operation Write Home! There are so many great cards posted, I hope you'll get a chance to see them all! I started with my standard Operation Write Home card base, which I print in bulk. You can download a pdf HERE. I print these out and cut the 8.5x11 sheet in half to give me two card bases - one landscape (like above), one portrait. I got the digital version of this many moons ago, but I like it because it has the logo, the website, and a small thank you. Operation Write Home receives thousands of cards, and it makes the shippers lives a bit easier if they are just ready to pop in a box to send out! 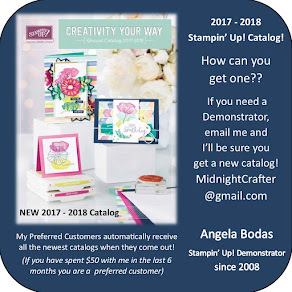 Your card needs to have OWH info on the back of the card, so you can use my pdf or you can get a free stamp from OWH, or purchase stamps made for this purpose. See the other card guidelines HERE. Onto the card base, I layered a 4 x 5.25" sheet of Stampin' Up! Old Olive card stock. On top of that is a 3.75 x5" sheet of Stampin' Up! Cherry Cobbler card stock. On top of that is the white layer which was embossed using the Perfect Polka Dots embossing folder (Stampin Up! #119976). I then layered some more Cherry Cobbler with a scrap of Jolly Holidays designer paper (Stampin' Up! retired) the dimensions are 3.75x2" red, 3.5x1.75 designer paper. 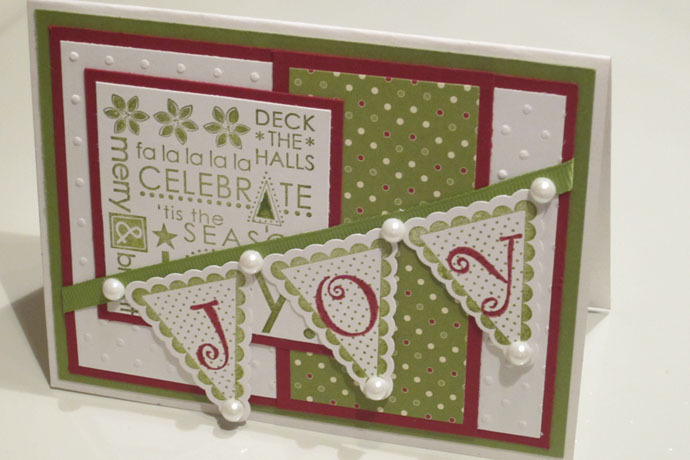 The stamped design is from the Season of Joy set (Stampin' Up #110384) one of my favorites. I stamped it in Old Olive classic ink and layered it onto another piece of Cherry Cobbler. Dimensions: 2.25 x 2.5" white stamped piece, 2.5 x 2.75" red. But I wanted to add a little something more, so I got out my Pennant Parade stamp set (Stampin' Up! #122742) and my coordinating Petite Pennants Builder punch (Stampin' Up! #122361). I stamped the polka dot pennant onto some white scraps, then I stamped using some of my kids alphabet stamps the letters J, O, and Y onto each pennant. These were punched out using the larger side of the paper punch, and I attached them with adhesive and some dimensionals to the Old Olive 1/4" Grosgrain Ribbon (Stampin' Up! #111368), after I had wrapped (and glued) it to the card. 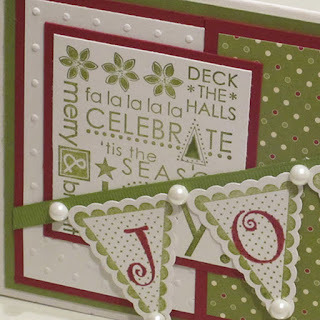 To finish it off I attached some half-peals from a retired kit, you could use the darling Basic Pearls (Stampin' Up! #119247) as well. Its a pleasure to support OWH, they are a very passionate and creative group of people! I highly recommend this organization to anyone looking for a service project or good place to send donation$! Just reading the stories from the heroes families who receive these cards, the effect a simple thing like a greeting card can have on a child or spouse or parent of one of our service members - that's inspiring! I am proud to support our troops through Operation Write Home I hope you will support them too!